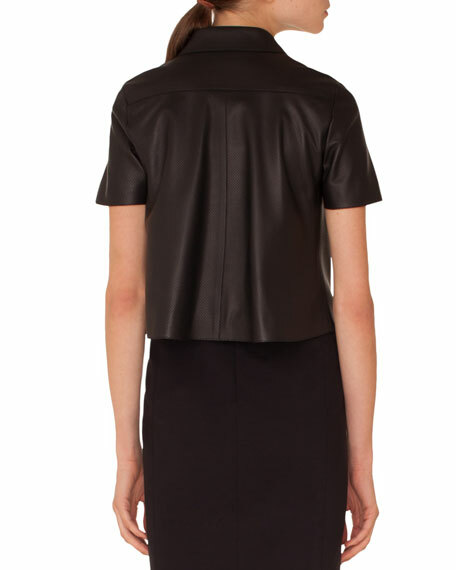 Akris punto jacket in perforated napa leather with bell-shaped back. Kent collar; zip front with O-ring pull. 3.1 Phillip Lim anorak jacket with cinched sleeve detail. Stand collar; two-way zip front; pull-ties at back. Long sleeves; press-button cuffs. Covered elastic sleeve detail. Rain flap at back; snap button. Snap left chest pocket. Relaxed silhouette. Drawcord hem. Lyocell/viscose/nylon. Dry clean. Imported. Etro jacket in quilted garden paisley floral print. Crew neckline; zip front. Long sleeves. Side slip pockets. Relaxed fit. Hem hits hips. Polyester. Trim, viscose/cotton. Made in Italy. Model's measurements: Height 5'10"/177cm, bust 33"/84cm, waist 25.6"/65.2cm, hips 35.8"/91cm, dress size US 2-4/FR 34-36. Neiman Marcus Leather Collection goat suede jacket. Crew neckline; zip front. Long sleeves; snap cuffs. Yoked back shoulders. Semi-fitted silhouette. Neiman Marcus Leather Collection goat suede jacket. Crew neckline; zip front. Long sleeves; snap cuffs. Yoked back shoulders. Semi-fitted silhouette. Slit pockets at side. Adjustable drawcord hem. Cropped above hip. Imported. Model's measurements: Height 5'10"/177cm, bust 33"/84cm, waist 25.6"/65.2cm, hips 35.8"/91cm, dress size US 2-4/FR 34-36.